Many people who are found of pickles, beets, green beans, and other pickled items often find pickling offers an ideal option for a tasty snack. One item that often is not considered for pickling is green onions. However, pickled green onions provides a delicious (and addictive!) salty treat to enjoy as a snack, tossed on salads and burgers, and immersed in Bloody Mary’s. As with all pickling, one important detail about pickled green onions is using the proper containers. Pickling is done by using an assortment of mason jars. If you do not have mason jars at home, then you need to see if you have a friend or family member with any that you can borrow. If not, pick some up at the grocery store. You will need to make sure your mason jars have been cleaned before they are used. However, they do not need to be sterilized in boiling water as you are not making preserves. If you do decide to boil all your jars to make pickled green onions, then you will have time to gather all the ingredients you need. The basic ingredients can be already in many kitchens. If you are missing a few, then a quick trip to a grocery store or a store with baking supplies is needed. You will need to have patience when making pickled green onions at home. The reason is because the more time you wait for the onions to pickle means the flavor will be much better. 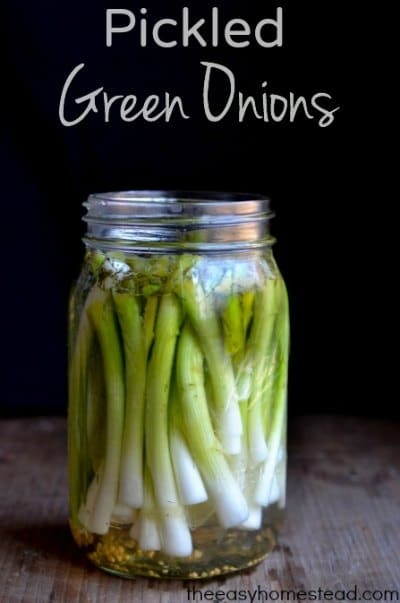 Your pickled green onions will need to be kept in your refrigerator. Each jar you make will be good up to a month. One thing you may want to do is make a batch of pickled onions as a basic gift for any friends and family members. As mentioned, these are rather addictive.